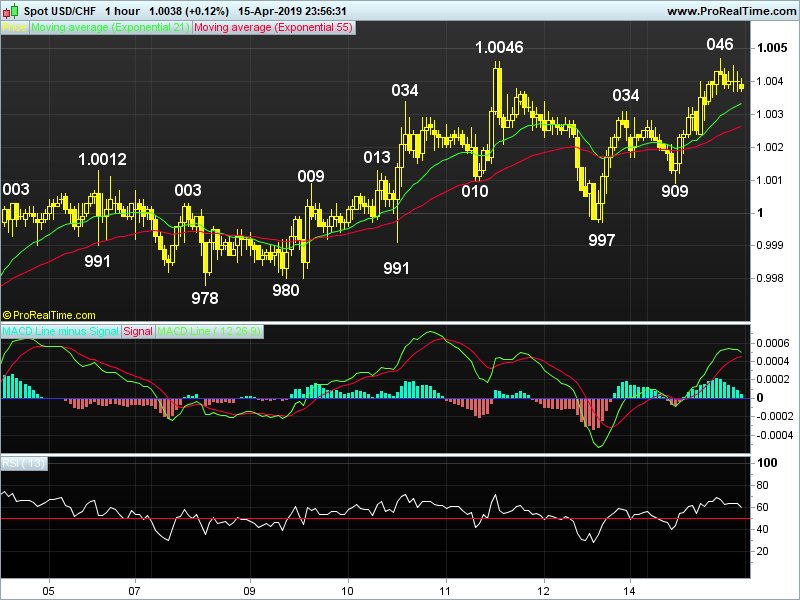 USD/CHF - 1.0038.. Despite initial retreat to 1.0009 in early European trading, price climbed steadily to session highs of 1.0046 in NY afternoon due to renewed buying in eur/chf cross n closed near the day's high. On the bigger picture, dlr's rally fm 2018 31-month trough of 0.9188 in mid-Feb to as high as high as 1.0068 (Jul), then to a 20-month peak at 1.0128 in mid-Nov signals downtrend fm 2016 6-year peak at 1.0344 has made a low. Despite subsequent erratic fall to a 3-month low at 0.9716 in Jan, dlr's rally to 1.0124 in early Mar suggests re-test of 1.0128 would be seen, abv would extend upmove fm 0.9188 to 1.0171, then 1.0248 later, prominent 'bearish divergence' on daily indicators should cap price below 2016 6-year peak at 1.0344. On the downside, only below 0.9878 signals choppy trading below 1.0128 would continue n risk is seen for an other fall to 0.9801, then twd 2019 low at 0.96716 (Jan). Today, dlr's gain to 1.0046 Mon on renewed buying in eur/chf cross suggests recent erratic rise fm Mar's bottom at 0.9895 would head to 1.0055/60 after consolidation, however, minor 'bearish dievergence' on hourly indicators are likely to cap price below 1.0098. Below 1.0009 signals top, 0.9997, 0.9978.